Queer Chocolatier Chocolate House at 1624 W. University Avenue in Muncie, Indiana. Window sign designed and installed by members of Studio 165+. Queer Chocolatier is on the very brink of opening as a chocolate house! It has been an extremely long time coming, but chocolate houses don’t just build themselves, you see. I am grateful for everyone’s patience and I hope that the wait is worth the reward! I am glad you asked because we want to take some time to help set expectations about where there will be differences yet some familiarities. Let’s start with what we have in common with coffee houses. Queer Chocolatier will be serving coffee. Not just any plain old coffee, either. We have established a relationship with a wonderful coffee roaster in Toledo, OH. Be prepared to enjoy the coffee from Flying Rhino Coffee! Angie Cucunato is great to work with as she is passionate about coffee, is a bottomless well of knowledge and resources, and is pretty rad. Great coffee from a rad person fits in with most other coffeehouses. But, we will not have an espresso machine or be making any espresso-based beverages; instead, we will sell retail bags of Flying Rhino Coffee espresso beans, both for you to use with your home espresso machine or for you to snack on after we’ve covered them in chocolate! Another similarity our chocolate house will have with coffee shops is the availability of baked goods. Our focus will be on creating delicious baked goods to pair well with your beverage of choice. We also want to put a lot of love and respect into the baked goods as to make them with care and attention; we don’t want to serve you a mindless muffin. We want to make you baked goods that sustain you after eating them while also making you crave your next one! Much like other coffeehouses—although not all of them are sticking with this model—we will have Wi-Fi available as you sit in our space and enjoy your treats. We will spend time with you to help you through your purchases. We aren’t here to rush you out the door, but we are aware folx have work and school and lives to get to quickly! But we are offering a new set of products and experiences and we want to have a conversation with you to guide you through all of this. 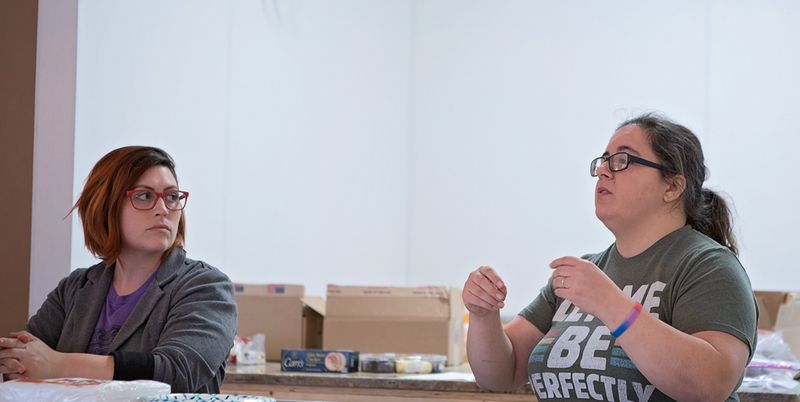 Co-owners Cheri Ellefson and Morgan Roddy facilitate discussion during the soft opening of Queer Chocolatier Chocolate House. Guided chocolate tasting events have been extremely popular since we began offering them in December 2017 and we will continue to offer such educational and fun activities where you can learn more about chocolate and your sensory abilities while also getting to laugh and share with others. Our events will continue to evolve and incorporate new lessons and ways to increase your awareness about chocolate and eating intentionally and indulgently. Cheri Ellefson, co-owner of Queer Chocolatier, reviewing her notes in the soon-to-be-open Queer Chocolatier Chocolate House. And we are also a space that will have resources to help you understand more and have conversations about gender, sexual, and relationship minorities through our growing book collection. While you’re in our shop, feel free to grab a book and flip through some pages or if you have a book you want to contribute to the shop, we would be glad to find a place for it on our shelves! Queer Chocolatier Chocolate House is a space that we’ve all been waiting for a long time to open! That time is coming very soon! But I hope now you have a better sense of what it is you’ve been waiting for this whole time!